Arjuna Dharmadas grew up in Germany and expanded an academic career by falling in love with meditation and yoga. 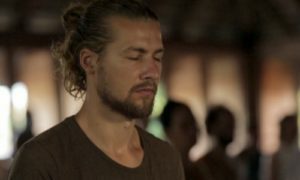 Over a decade of traveling and learning led him to cross paths with Hridaya Yoga and eventually settle in Guatemala to manifest a spiritual center with his wife, Arpita, in May of 2012. What is the name of your branch and where are you located? Mahadevi Ashram is located overlooking picturesque Lake Atitlán in Guatemala. The lake and the surrounding volcanic valley are revered for their serenity and sacredness by the indigenous Maya as well as spiritual seekers. The ashram features eco-friendly bamboo and earth architecture set in a jungle garden that serves as an ideal sanctuary for spiritual growth. What ongoing courses and activities do you offer? 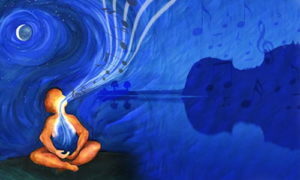 We offer periodic Hridaya Silent Meditation Retreats, Hridaya Hatha Yoga courses, and Tantra Yoga retreats. We also host various other workshops and weekly cacao kirtans. You can see our calendar here. What stands out most about your branch? Mahadevi Ashram is special because of its setting and the way various practices and traditions are fused together without losing devotion. Outside of the ashram, guests can enjoy all of the natural wonders that are offered by the volcanic crater and lake, which are perceived by many as a spiritual vortex. There are also opportunities to visit the nearby community of San Marcos and access a wide variety of other healing arts and spiritual traditions, including those offered by a diverse Maya community. Inside the center, guests are presented with an atmosphere of a dedicated long-term residential ashram guided by the spirit of service and dedication. The practice of kirtan is very dear to the teachers and residents, and that sanctity can be felt in the genuine presentation of teachings that synergize tantric and vedantic approaches. What does the future hold for Mahadevi Ashram? We aspire to be in the Now, even in times to come. Being dedicated to the Divine Mother, the ashram is a very powerful container for spiritual practice, purification and the opening of the Heart. We often feel that we’re mostly here to do service and sing the Names. Everything else is just a gateway towards these practices.